Just taking a moment to wish my lil bubba a happy 11th birthday today. You are my most precious gift, and I love you with all my heart buddy!! Aww how cute. 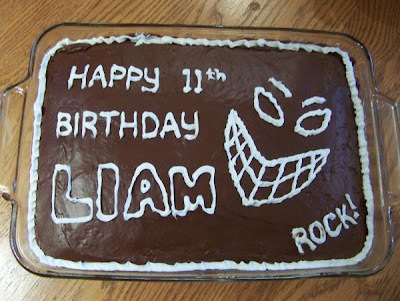 Happy B-day Liam. Want to share a piece of that cake with me? lol Have a great night with your son. It is my mom's b-day today too. What a great cake!!!!! Thank goodness I am not a big chocolate fan! Rock on! Happy (belated) Day! The cake is so cool. A happy b-day to your boy. That cake looks delicious! Oh, to be 11 again.